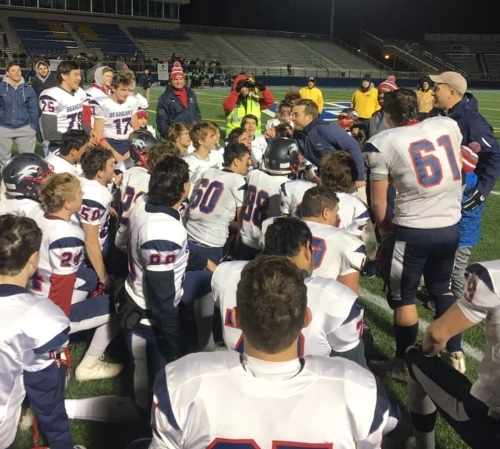 For the first time in 13 years the Cold Spring Harbor football team is headed to the Long Island Championship. The highflying Seahawks defeated Seaford 27-7 last weekend in the Nassau title game after losing to the Vikings at the same stage last season. Head Coach John Mendreski said his team used last year’s loss to Seaford as motivation going into last Friday’s game at Hofstra. The Seahawks defense dominated the Vikings for the first three quarters and allowed only seven points all game. Senior defensive back Thomas Milana’s interception stopped Seaford’s opening drive and set the tone for the Seahawks defense. On offense, the Seahawks running game overpowered the Vikings defense. Senior running back Daniel Striano had his break out game of the season after previously suffering both a back and knee injury. Striano was the feature back for the Seahawks. He scored three unanswered touchdowns on the ground to give the Seahawks a commanding lead. He rushed the ball 16 times for 134 yards and three scores. Quarterback Ray Costa contributed 39 yards on seven rushing attempts, while Striano’s younger brother junior Richie Striano rushed for 24 yards. The Seahawks took a 19-0 lead into the fourth quarter, and a 48-yard rushing touchdown by Jacob Bruno ended Seaford’s comeback attempt and secured the 27-7 victory. The Seahawks are set to travel to Stony Brook University on Friday at 4:30 p.m. to take on the Wildcats of Shoreham-Wading River for the Long Island Division IV title. Despite the emotion, Mendreski wants his team to enjoy the experience.